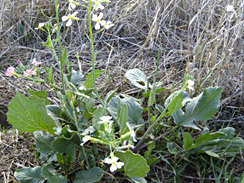 The wild radish plant (Raphanus raphanistrum) is quite similar to wild mustard, and is in fact a member of the brassicaceae (mustard) family. Like mustard, wild radish produces deeply-lobed bushy leaves near the soil, while its long leggy stem pushes upward with seed pods topped by flowers. Wild radish flowers come in a variety of colors, most commonly purple here in southren Cali, though white is also common, yellow less common. The four-petaled flowers are sometimes described as mini helicopters. Petals can take on the look of hand-crafted paper with dark color veins. 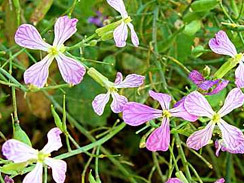 Wild radish flowers measure about 3/4″ wide, and grow singly one per stem. The plant has a spicy taste very much like domestic radish. Flowers can be tossed in salads, leaves sautéed as greens. Its mild-tasting roots, stripped of their tough outer layer, can be cooked. 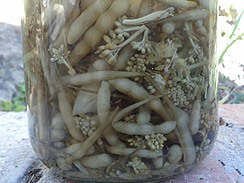 Pods can be eaten raw, cooked, pickled and preserved. 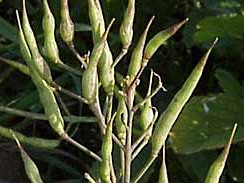 Pods become hard and woody with age; harvest younger pods while still crisp and tender. Wash pods, remove stems. Boil water in small saucepan, remove from heat and plunge pods into water until they turn bright green (1-3 minutes). If pods still haven’t turned bright green or softened enough, boil another round of water and repeat the plunge. Strain off water and transfer to sterilized glass jar. Add sliced red onion, sliced jalepeno, pepper corns, herb leaves and cleaned mustard flowers. Boil vinegar, then add to glass jar entirely submerging all foods. Drizzle on oil. Allow to cool, then cap with lid and refrigerate. Allow to marinate for 2-3 days before consuming. Pods kept submerged in vinegar should last 2-3 months, perhaps longer. For a sweet and sour taste, try adding 2 tbsps brown sugar while heating the vinegar.